The rising authority of neo-traditional urban planning and design – either in the United States via New Urbanism or in Europe via the European Urban Renaissance – might provide much needed answers to the failures of modern urbanism to produce sustainable urban environments. Nevertheless, the ethos of Modernist spatial planning seems to be pervasive on current planning processes despite its many flaws. 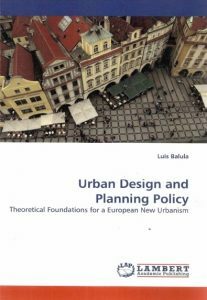 The first part of this book shows how urban design theory – and in particular neo- traditional urban design theory – might inspire and reform current planning practices so as to counteract incoherent urban growth and promote a more inclusive and sustainable urbanism. In the book’s second part, a contextual analysis of the Portuguese planning system provides an in-depth case study that probes the ability and constraints of a local planning and development control framework to incorporate urban design issues and concerns. Urban design as public policy, the overarching subject of the book, is a theme that should appeal to planners, architects, engineers, geographers, public officials, and anyone else with an interest in cities and urban affairs.